Latest car news in India: From a racing version of Lamborghini’s super fast SUV Urus to a convertible version of the iconic Bentley Continental GT and more, here’s everything to keep yourself updated with everything from the world of luxury cars. The twin-turbo V8 has also been re-tuned to pack more power, which produces 650 horsepower. Lamborghini revealed the Urus last year, creating a completely new segment of high-performance SUVs. In fact, Lamborghini claims that the Urus is "the world’s first super sport-utility vehicle.” To highlight its sporty credentials, the Italian marque has introduced a one-make racing series for the Urus, which will have a combination of races on both race circuits as well as off-road tracks. Competing in the series will be a racing version of the Urus, called the Urus ST-X. The racing version is 25 per cent lighter than the standard Urus, which can be largely credited to the stripped out interior. It features all the mandatory FIA racing safety features, including a steel roll cage integrated into the frame, a fire suppression system, and an FT3 fuel tank. The racing version is fitted with centre-lock 21-inch wheels shod with sticky racing Pirelli tyres. The twin-turbo V8 has also been re-tuned to pack more power, which produces 650 horsepower. 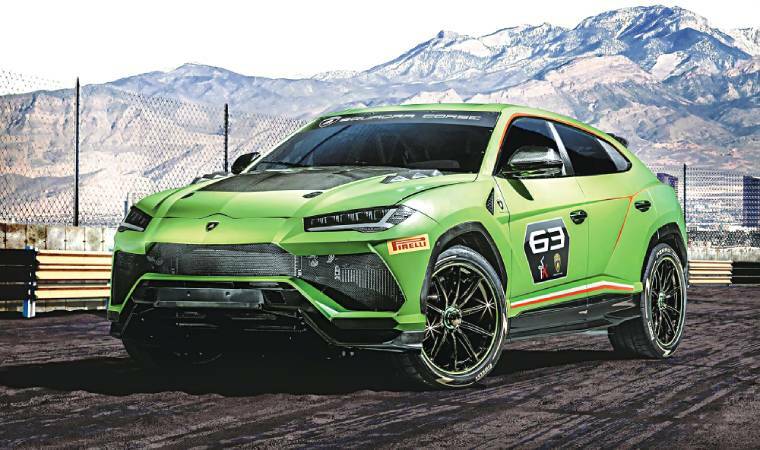 The Urus ST-X is scheduled to debut on track during the 2019 Lamborghini World Finals. The engine is unchanged; it is powered by the same 577 horsepower twin-turbo 4.0-litre V8 engine. 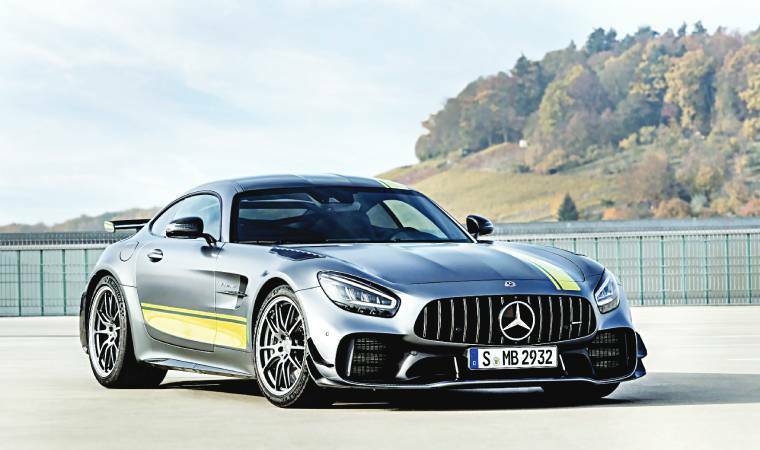 Mercedes has revealed the updated AMG GT sports car and also announced a new range-topping model based on the GT R. Called the Mercedes-AMG GT R Pro, the racetrack-focused limited model will only be available for the 2020 model year. Mercedes claims that the GT R Pro was developed using experience gained from racing the AMG GT3 and GT4, which has helped it lap the iconic Nurburgring in just 7 minutes and 4.6 seconds—4 seconds quicker than the standard GT R. to make it lighter and faster around racetracks, the GT R Pro will include several aerodynamic elements for additional downforce, all made in lightweight carbon fibre. Other performance updates found under the skin include carbon ceramic brakes and uprated suspension systems. The engine is unchanged; it is powered by the same 577 horsepower twin-turbo 4.0-litre V8 engine. It is powered by the same 306 horsepower 3.0-litre V6 diesel engine. 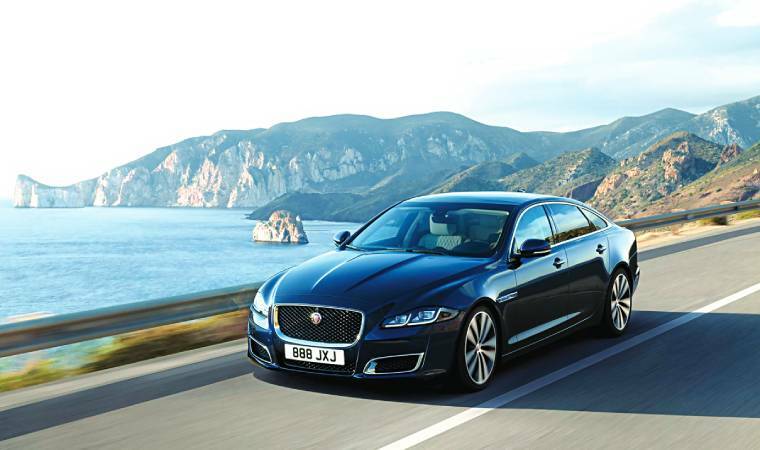 Jaguar Land Rover has launched a special edition variant of its flagship XJL sedan in India to celebrate five decades of the XJ being on sale globally. Called the XJ50, it is priced at `1.11 crore (ex-showroom). The XJ50 features several aesthetic updates to set it apart from the standard version. The differentiating elements on the exterior include a new Autobiography-style front and rear bumpers, new 19-inch 10-spoke alloy wheels, a chrome radiator grille, XJ50 badging and four new colour options: Fuji White, Santorini Black, Loire Blue and Rosello Red. Inside the cabin, the XJ50 gets diamond-quilted seats and XJ50 logo on the centre armrest, along with XJ50-badged illuminated treadplates, anodised gearshift paddles and bright metal pedals. Mechanically, the special edition is identical to the standard XJL. It is powered by the same 306 horsepower 3.0-litre V6 diesel engine. The revamped cabin is heavily inspired by the new Cayenne and Panamera. Porsche officially lifted the veil off the next-generation 911 sports car at the 2018 LA Auto Show. 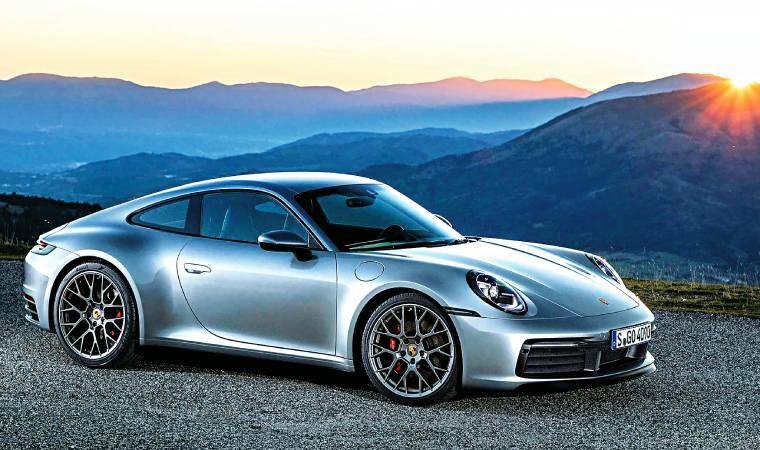 The 992-gen Porsche 911 is more evolutionary than revolutionary. It retains all the instantly recognisable design aspects carried over from the previous seven generations, to make it unmistakably a Porsche 911. The 2020 models are powered by an updated version of the 3.0-litre flat six from the previous generation, which now makes 450hp (an increase of about 30hp). In both the variants, the engine is mated to a new 8-speed automatic, making them quicker by almost half-a-second in the zero-to-100kmph sprint. In terms of aesthetic updates, most changes are visible at the rear, with a redesigned bumper with muffler design and a full-width LED taillight. The revamped cabin is heavily inspired by the new Cayenne and Panamera. The Aston Martin DBX is scheduled to be unveiled in the last quarter of 2019. Aston Martin revealed the first set of pictures of its upcoming sports SUV, along with announcing its official name: the DBX. Most of the details are still shrouded in secrecy and the prototype in the pictures is hidden in bright fluorescent camouflage. But there are several design details which are immediately noticeable. Rivalling the likes of Lamborghini Urus, the Aston Martin appears to be the same size of the Porsche Macan. The DBX is believed to share the same platform as the DB11 and appears to share design cues with the carmaker’s entry-level Vantage — at least on the front end. The silhouette of the SUV indicates muscular body lines and an integrated spoiler on the back. 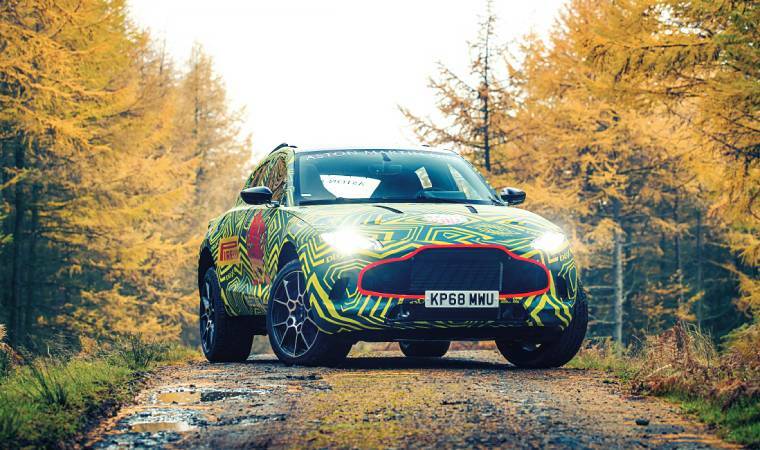 Aston Martin says that the DBX will feature the same level of sporty performance and driving dynamics while being completely adept at dealing with off-road conditions. Aston Martin specifically chose to picture the prototype on a rally stage in the UK to emphasise on its off-road capabilities. The Aston Martin DBX is scheduled to be unveiled in the last quarter of 2019. It has the same luxurious interior as the coupe as well, which is wrapped in plus leather and stunning veneered wood. 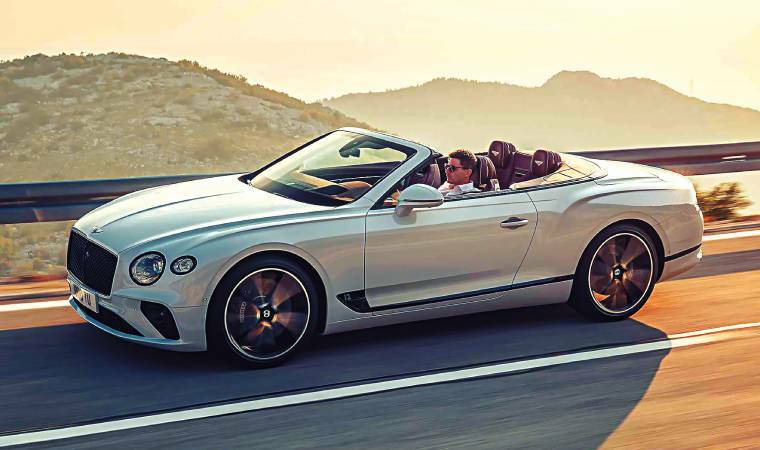 Bentley has revealed the convertible version of the luxury grand tourer. The top-down Bentley Continental GT is almost a mirror image of the coupe version, except for a few key features, including the foldable soft-roof that takes 19 seconds to deploy at speeds up to 48kmph. For the first time, Bentley is also offering tweed (rough, woollen fabric) as an option for the fabric roof. The cabriolet is powered by the same 6.0-litre W12 engine as coupe which produces 626 horsepower. It can accelerate from zero to 100kmph in just 3.8 seconds and reach a top speed of 333kmph. It has the same luxurious interior as the coupe as well, which is wrapped in plus leather and stunning veneered wood.